When I was in college, there was a small abandoned insane asylum not too far away from the town. It was, of course, haunted... and thus, it was, of course, an incredibly popular place for college students to sneak into at night. I remember sneaking onto the grounds after midnight with a few friends. We didn't even break into the buildings, just goofed around in the areas between them. I don't believe in ghosts, but there's 'not believing in ghosts' and then there's 'I'm at a haunted abandoned insane asylum at midnight and I don't believe in ghosts', which is to say, of course I was terrified of ghosts the whole time. I remember two friends exploring one part of a courtyard while I hung back. I remember hearing something - footsteps, a whisper? - right behind me. I remember turning around and seeing... nothing. Nothing bad happened to us that night; we had a good, creepy time one late October evening, and then we left. 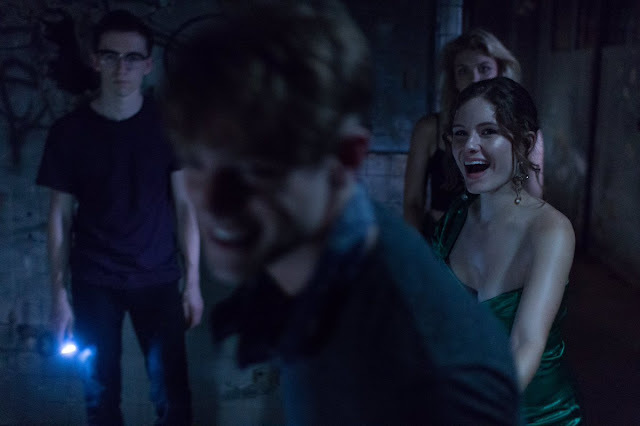 Which is to say, sometimes, teenagers do stuff that in the context of a horror movie is incredibly stupid - like exploring an abandoned insane asylum and then splitting up - but in the context of real life is mostly fine. Nothing bad will happen. You'll scare yourselves, and then you'll stay up way too late eating junk food and telling each other stories about what you imagine might have happened. I had never really seen a film recreate this particular kind of teenage night effectively until I saw The Honor Farm. I feel like the last few years have opened up something of a dialogue about what the genre of horror is. To many purists, only films that follow a very specific series of tropes - slashers, body horror, etc... - are real horror. Even something that pulses with menacing dread, something like The Witch or It Comes At Night aren't really horror so much as very tense dramas. While I couldn't disagree more with that mindset, it's unquestionably a conversation that is being discussed in horror circles. The Honor Farm is at the extreme end of the "Can this really be called horror?" spectrum, I think, a movie that will baffle and frustrate fans looking for, well, a horror film. The movie is set up like a horror film, pitched like a horror film, it has all the trappings of a horror film, but what I find most intriguing about The Honor Farm is that, at its heart, it is mostly a coming-of-age story. A weird, drug-fueled, hallucinogenic coming-of-age story, certainly; at times, even an eerie one. But I still think that that's the better descriptor. Go into The Honor Farm expecting It Follows and you'll leave disappointed; go in expecting The Myth of the American Sleepover and you'll likely have a good time. 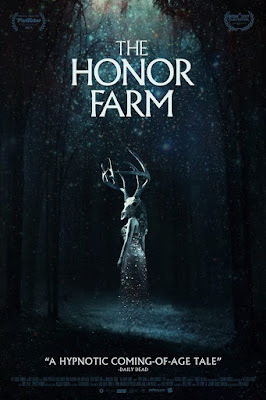 The Honor Farm reminds me a lot of the work of Sarah Adina Smith, an up-and-coming indie filmmaker who got her break on the festival circuit with The Midnight Swim, another film that really pushed at the edges between horror and mundanity. Though she followed it with the more complex, messier (superior) Buster's Mal Heart this year, The Midnight Swim got a lot of attention for the way it used horror tropes without really fully becoming a horror film. Indeed, its ending is surprisingly... if not warm, then at least not the corpse-cold chill horror fans have come to expect. 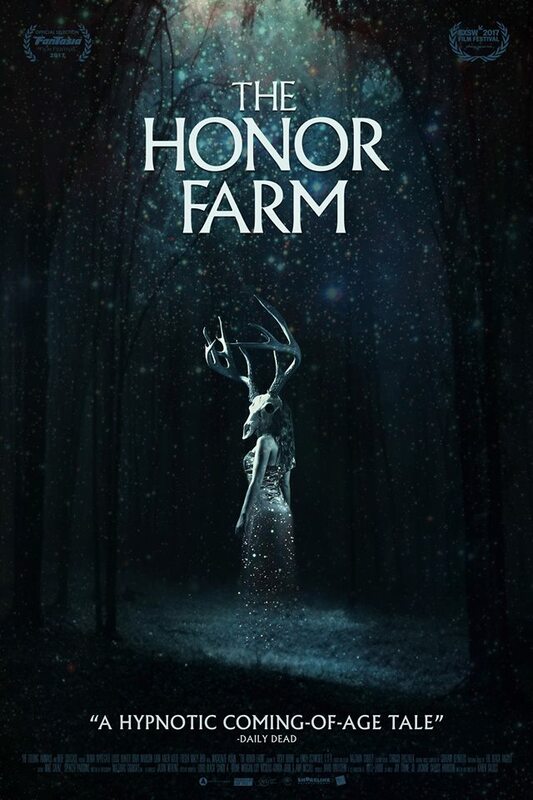 The Honor Farm is a lot like that one, bringing in a haunted prison, arcane rituals, a demon in a stag-skull mask -- but bringing them in to tell a story that isn't too different from, say, The Breakfast Club, about a group of high school kids who might not be friends otherwise, except for a crazy bonding experience that brings them together. It is unquestionably a spoiler to say that all of our leads survive, but it's an important one; these kids are dealing with grief and disappointment, yes, but not the outright trauma associated with the final girl. Which, I'm honestly okay with; I legitimately liked this cast quite a bit. The film initially seems to be setting up a story in which the goth kids and burnouts get the two prom princesses (Olivia Grace Applegate and Katie Folger, both very good here) who are having a bad night in waaaay over their heads in a horrifying scenario, but writer/director Karen Skloss pivots in an interesting direction after the setup: Instead, they all take mushrooms together. The tripping scene here felt very true to life, and I was intrigued by how quickly it bonded the group. On mushrooms, their cliques disappeared, and they seemed to genuinely become friends. Ultimately, I was a little disappointed by the film's refusal to really bend towards its horrific impulses, because director Karen Skloss has a fantastic eye for eerily surreal imagery that could be used to great effect in a more traditional genre film... but the warm script and realistic characters, all well-played by a group of talented young actors, won me over. The Honor Farm's hypnotic charms are engaging and delightful, its surreal imagery eerie but not horrifying. The woods, it turns out, are a lot less scary the morning after. The Honor Farm is out now on-demand on services like Amazon. Directed by Karen Skloss and written by Karen Skloss, Jasmine Skloss Harrison, and Jay Tonne Jr., The Honor Farm stars Olivia Grace Applegate, Louis Hunter, and Dora Madison.